MARIETTA, Ga., December 3, 2018—Guilford County, North Carolina sheriff’s deputies used their new portable TC-400 radar speed signs from Radarsign to warn drivers to slow down on Halloween. The TC-400 was specifically designed to be used in multiple locations using Quick Mount GoBrackets. By installing brackets on multiple existing poles, law enforcement can establish a circuit and regularly rotate locations of the radar speed signs for ongoing traffic calming. This is exactly how the county will use the three recently purchased signs, but Capt. Randy Shepherd was able to capitalize on another benefit of the TC-400’s portability this Halloween—the signs can be moved at any time to respond to a speeding complaint or for a community’s special request. 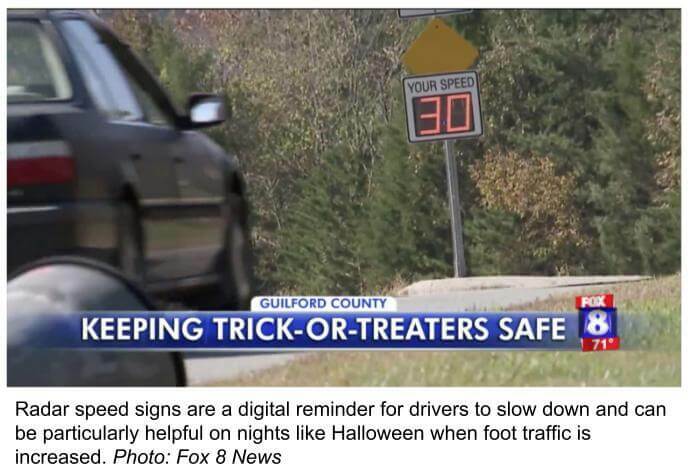 Shepherd told Fox8 News that the new radar speed signs were one way deputies provided safety to neighborhoods on Halloween. Law enforcement might plan to have spare patrol cars out patrolling neighborhoods on nights like this to act as a speed deterrent, but sometimes these cars are pulled away to answer calls. Radar speed signs are a consistent fixture that law enforcement can count on throughout the night to make drivers aware of their speed. In 2004, Radarsign® Brand Radar Speed Signs established new industry standards for traffic calming solutions with the debut of the world’s first armored driver feedback signs. Radarsign radar speed signs are vandal, weather and bullet-resistant. They are also the traffic calming industry’s most durable, most ecological and most energy efficient radar speed signs. Engineered and manufactured in the USA, all base Radarsign models are MUTCD-compliant and utilize recycled aluminum, innovative LED reflector technology, minimal battery power and solar panels to deliver bright, easy-to-read feedback to drivers. Radarsign products are scientifically proven to reduce drivers’ speeds and have been entrusted to provide safe and effective traffic calming solutions for: municipalities, treasured national parks, schools, neighborhoods, military bases, and private and public development projects across the U.S., Canada and overseas. www.radarsign.com.